Madison Avenue knows a thing or two about who we Dallasites are, what we want, and — more importantly — what we need. 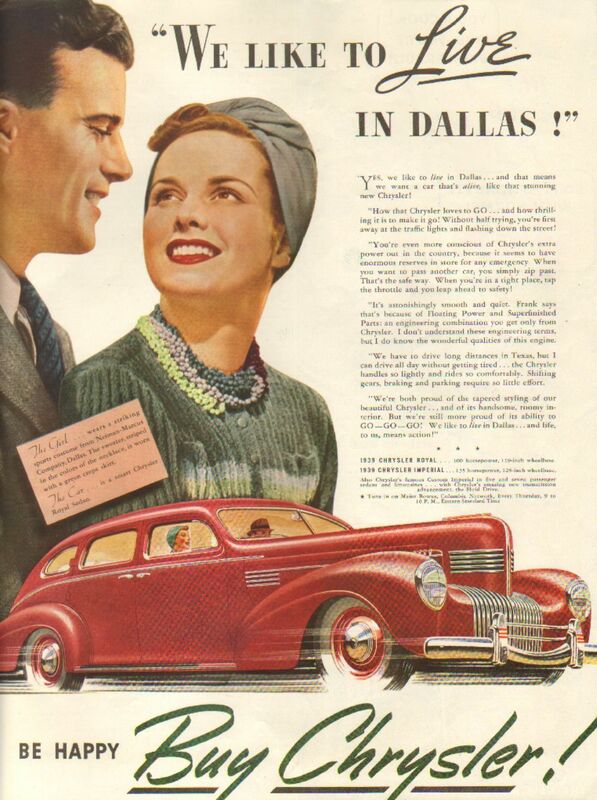 “Yes, we like to *live* in Dallas … and that means we want a car that’s *alive* like that stunning new Chrysler! “How that Chrysler loves to GO … and how thrilling it is to make it go! Without half trying, you’re first away at the traffic lights and flashing down the street! “You’re even more conscious of Chrysler’s extra power out in the country, because it seems to have enormous reserves in store for any emergency. When you want to pass another car, you simply zip past. That’s the safe way. When you’re in a tight place, tap the throttle and you leap ahead to safety! “It’s astonishingly smooth and quiet. Frank says that’s because of Floating Power and Superfinished Parts; an engineering combination you get only from Chrysler. I don’t understand these engineering terms, but I do know the wonderful qualities of this engine. “We have to drive long distances in Texas, but I can drive all day without getting tired … the Chrysler handles so lightly and rides so comfortably. Shifting gears, braking and parking require so little effort. THE GIRL … wears a striking sports costume from Neiman-Marcus Company, Dallas. The sweater, striped in the colors of the necklace, is worn with a green crepe skirt. THE CAR … is a smart Chrysler Royal Sedan. Click ad for readable text and to get a closer look at that necklace and oddly hausfrau-ish turban.